Camera viewfinder campaign a success, says Which? The Fuji X100's hybrid viewfinder is an example of its campaign's success, claims Which? Several big camera manufacturers are responding to consumer calls and developing compact cameras with viewfinders, according to consumer group Which? Which? 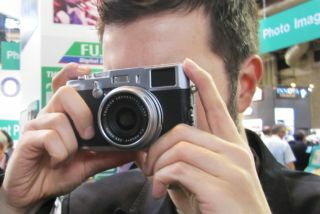 points to the Fuji X100's new hybrid viewfinder and the Canon PowerShot A1200 as examples of camera manufacturers heeding its call to bring back viewfinders on compact cameras. The campaign follows research conducted by Which? that found 70% of photographers struggle to use an LCD screen in bright daylight. A further 60% said they would find it easier to take pictures if their camera had a viewfinder. "Many of us are content to rely on our camera's LCD screen, but the response we've had from consumers shows there's strong demand for compact digital cameras that also have a viewfinder. It's encouraging to see that several big manufacturers are taking note," said Hannah Joliffe, of Which? Conversation, an online community where consumers can engage with Which? experts and industry insiders. Which? claims that Sony and Panasonic were also receptive to its research, and are sharing the group's findings with their development teams.